With big-power BMWs, one of the biggest problems is getting that power to the wheels. The common weak point is the clutch assembly. One of UUC's specialties is clutch and flywheel assemblies designed specifically to cure this problem. We offer a line of products ranging from simple replacement clutch kits all the way up to multi-disk clutch and flywheel assemblies. Our Twin Disk packages are proving to be very popular and reliable with the tuned high-power car owners. Applications available beyond 1,000hp and suitabel for daily-driven BMWs. A special flywheel design allows virtually all E46, E36, and E30 models to use the better clutch design from the E34 M5. 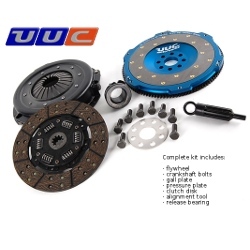 With a factory clutch option designed for a larger and more powerful car, and UUC options for further increased power levels or competition use, this setup combines affordability, reliability, and readily available replacement parts. Upgraded clutch kits for use with original BMW flywheels. We offer multiple surface material options depending on power and anticipated usage style (street/track/drag/drift) along with a high clampload pressure plate design for increased torque capacity. For these applications, the original flywheel is used for OE-like driving response. Fitments available for most BMW models with manual transmission/SMG/SSG. All products proudly Made in USA.